The YewdaleMovatrack 300 telescopic divider rail has a high-grade, yet lightweight aluminium wall mounted rail as standard. Folding mechanism utilises aluminium components for long-term reliability. 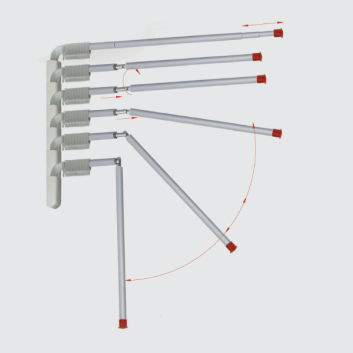 The curtain arm is adjustable in length up to 2100mm depending on model. Curtains are mounted to the rail by large plastic loops for ease of application. 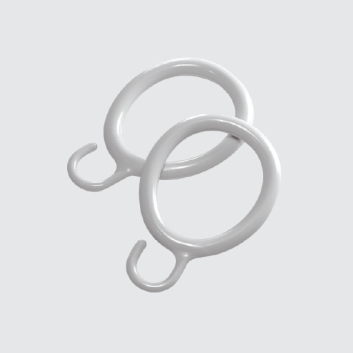 YewdaleMovatrack® 300 is designed specifically for doctors surgeries, hospitals, and other healthcare institutes where space and privacy needs conflict, or where a fixed track is not felt suitable. This unique system revolutionises space utilisation and caters for overhead hoists and other lifting equipment. The system comprises of a telescopic divider rail with light weight flame retardant curtains, that can go from its almost unseen closed position against the wall, to a full screen in 10 seconds. By having the choice of length of telescopic arms along with colours of curtains, ensures the product fits well within its environment. The YewdaleMovatrack® 300 telescopic divider rail as manufactured by Yewdale +44 (0)1268 570900. Lightweight telescopic aluminium track and curtains with unique fold-down mechanism. 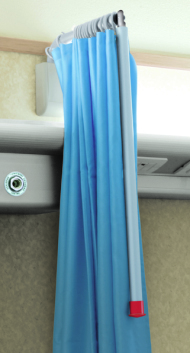 Flame retardant curtains from the YewdaleHarrier® range.